A delicious take on an family favourite, that warm and hearty. Great for any time of the year. mix to combine. Add the olive oil, chilli fakes and salt to taste. oil and repeat with the remaining beef. Reduce the heat slightly and add the remaining tablespoon of oil to the pan, followed by the onion, carrots, celery, garlic and thyme. Sauté for 6 to 8 minutes, until softened. Return the beef to the pan along with the stock. Bring to the boil, then reduce the heat and simmer for 1 hour. Add the pearl barley and continue to cook for at least 1 hour more, until the beef is tender and the pearl barley is cooked. Season to taste. 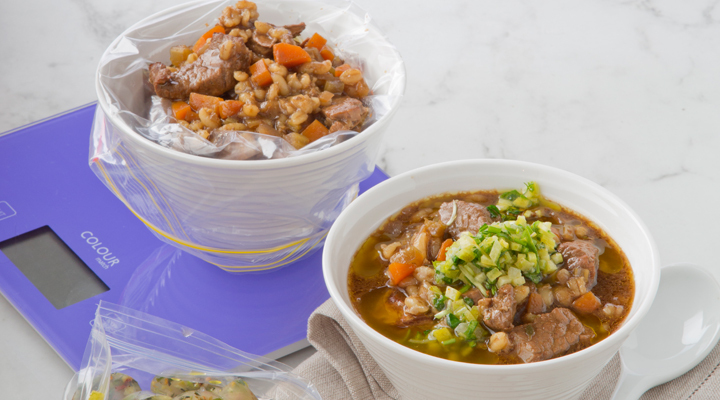 To serve, ladle the stew into bowls and drizzle the gremolata dressing on top for extra favour.